Thank you so much for visiting my website! I hope that you find your next champion with me! I am a fairly new artist, but i strive to do the best work i can! I use acrylic paints and pastels to create all of my horses. SM/LB/Micro Minis are my passion, and I exclusively paint those scales. For those of you who are wondering.. what is Kingyo? Its "gold fish" in Japanese. I use to own a 6 inch Rancu Goldfish, named dunphy, he is responsible for the name! he was such a great little fishy! I miss him so much! 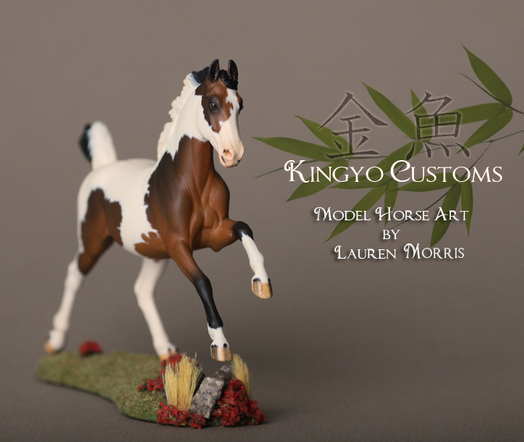 I am located in Texas at the moment (Army Wife) and I paint wee-little horses full time! To see when commissions open please follow me on my facebook page, or sign up for my newsletter to be notified when they do open. I try to maintain this site on a weekly/daily basis, so keep checking back for new additions to the Artist Gallery! Thank you so much for stopping by!